Maxine Pearl Fricke was born on March 8, 1923 to Ted and Ella Anderson. She passed away peacefully at the Medicine Hat Hospital on Aug. 5, 2018 at the age of 95. 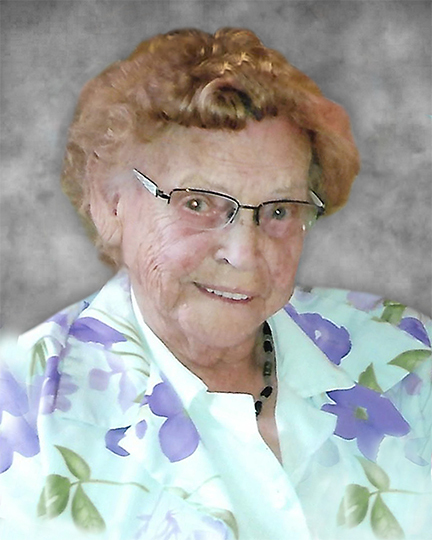 Maxine leaves to cherish her memory, three daughters – Charolette Somers (Glenn) of Calgary, Myrna Widmer from Maple Creek and Shawna Phaff (Rod) of Dunmore. Her grandchildren, Trevor Somers, Ryan Somers (Jacquie), Tricia Ressler, Kevin Koch, Quincy Phaff and Amelia Phaff. Her great-grandchildren, Cypress Koch, Ursa Koch, Olivia Ressler and Dahlia Somers. She also leaves behind 3 sisters, Bonnie Eremenko, Betty Munro and Doris Green and many nieces and nephews. She was predeceased by her husband, Marvin in 2014, parents, Ted and Ella Anderson, 7 brother-inlaws, 2 sister-in-laws and 2 nephews. Maxine became a teacher and over the years taught at Downie Lake, Red Lake, Kincorth, Box Elder Colony and Sidney Street School. Maxine married Marvin Fricke on Oct. 29, 1946. They purchased a farm along the #1 Highway in 1950 where they raised their 3 daughters. They resided there for 55 years until they retired to Maple Creek. Maxine loved the farm life and worked hard helping Marvin on the farm. Along with farm chores, she had her domestic jobs and parented 3 children. One of her hobbies on the farm was raising exotic chickens which were her pets. Over the years, Maxine had many other hobbies which included curling, quilting, painting rocks, gardening and playing cards. She also spent many hours watching curling on TV. She loved to visit with family and friends. Maxine was a wonderful wife, mother, grandmother, great-grandmother and friend and will continue to have a huge influence on her family’s lives. She will be remembered as a caring lady who had a tremendous positive attitude which served her well in her 95 years. She accepted what life threw at her and she never gave up hope. Maxine was a woman of strong but quiet faith that carried her throughout the trials and tribulations of life. Her family was also very important to her and she was always interested in their lives. Maxine lived a full life and was able to stay in her house until 2 days after her 95th. birthday. Until then, she was still driving her car, taking care of her yard and continuing with her many hobbies. A funeral service was held at the Salvation Army Church on Aug. 10, 2018 officiated by Captain Ed Dean. Maxine’s niece, Isabelle Buehler read the Eulogy. The soloist was Allison Gordon and pianist, Lynda Udal. A special tribute was read by Myrna Widmer and Trica Ressler. Pallbearers were Ryan Somers, Glenn Somers, Trevor Somers, Rod Phaff, Shawna Phaff, Tricia Ressler and Thad Karwandy. There was a private family interment at the Maple Creek Cemetery followed by a luncheon provided by the Salvation Army ladies. As an expression of sympathy, donations can be made to the Lutheran Hour.